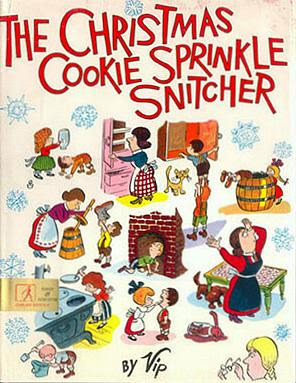 Bookride: The Christmas Cookie Sprinkle Snitcher, 1969. VIP (i.e. Virgil Franklin Partch) THE CHRISTMAS COOKIE SPRINKLE SNITCHER. Windmill Books/Simon and Schuster, New York, 1969. Simon & Schuster Children's Publishing Co.
Part of a valuable vein of children's Christmas literature - The Night Before Christmas, How the Grinch Stole Christmas! Madeline's Christmas (Bemelmans) Snow Before Christmas (Tasha Tudor) Babar And Father Christmas, Christmas at the Rose and Crown (Alison Uttley) not forgetting A Christmas Carol (with Stave 1, naturally.) Outlook? If Rick Richter listens to the pleas and reprints, it may dip in price for quite a while but the true first of this charming, uncomplicated bedtime story will surely always be wanted. We told this story at the West Branch Library in Kenosha, WI, around 1989. All we had was a typewritten script - I didn't even realize the book existed! New copies are for sale online at several bookstores for around $12 now.